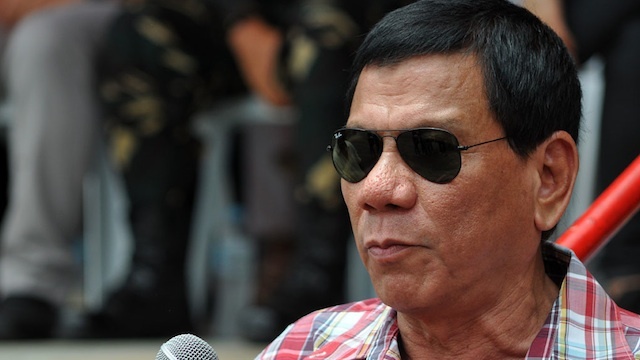 ﻿ Duterte: "100,000 criminals will be dumped in Manila Bay if I'm president"
Davao Mayor Rodrigo Duterte is not worried about the Human Rights groups pursuing him for his alleged role in the Davao Death Squad. On Sunday, Mayor Duterete said that the 1,000 summary executions he is being accused of since 1999 will reach 100,000 if he becomes the president of the Philippines. “Pag by chance that God will place me there, magbantay kayo, kay ang 1,000 na ito maging 100,000. Diyan mo makita tataba yung isda diyan sa Manila Bay, diyan ko kayo itapon,” he said. Duterte challenged international rights watchdog Human Rights Watch (HRW) to proceed in filing a case against him, saying they will find nothing on him. However, this week the mayor admitted his part in the DDS and now faces new accusations against him, even going as far as having De Lima say he must pay for his crimes against humanity. “Gusto ko sila pumunta didto. File a case directly in court. Just execute an affidavit, then I’ll call when it’s my time for cross examination. Mamatay na lang sila, I will cross examine you until Kingdom come,” the mayor said in his weekly television show. “It will give me hours just to put you in shame,” he added. Duterte also challenged HRW to prove its case on the 1,000 he supposedly executed over the past 16 years. “If I catch you lying, I will really pin you down. Siguraduhin mo lang na sigurado ka, baka ipapatay din kita for dragging me into something which I did not do,” Duterte said.